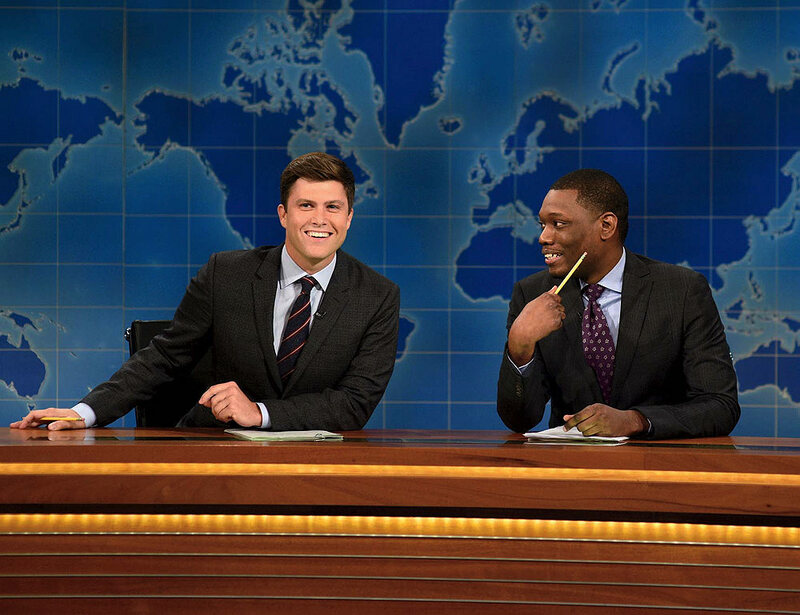 Colin Jost writes jokes for page, stage, and camera. When developing a sketch for SNL, Jost often starts by thinking of a voice, and then deciding which actor could most naturally embody it. He created the character Drunk Uncle, for example—meant to “sound like an uncle pretty much everyone has”—by working with cast member Bobby Moynihan. Drunk Uncle makes comments ranging from cringe-worthy to downright racist, almost always circling back to how America just isn’t the country it used to be. While dreaming him up, Jost and Moynihan thought about the character’s family, his pleasures, and his grievances, and slowly, his personality began to develop: sloppy, brash, old-fashioned. This technique is key to creating strong SNL characters, but Jost has found that it actually hampers his ability to write the kind of humor that appears only on the page. Early in his career, he had been keen to contribute Shouts and Murmurs because the columns struck him as similar to what he’d done for the Lampoon. But after years of working on the show, he found it difficult to switch back to magazines. “If I had someone’s voice in mind for a character that I was writing, other people didn’t necessarily hear the same voice,” he says. These days, Jost is best known for co-anchoring SNL’s Weekend Update, a segment that parodies a traditional news desk. It’s a big seat to fill: previous hosts have included Chevy Chase, Seth Meyers, and Amy Poehler. But after years behind the scenes, Jost itched to put his stand-up skills to use. The Update desk turned out to be the perfect fit, despite his initial anxieties. “I didn’t feel the self-confidence I had on stage as a stand-up at SNL, and that was a hard, hard transition,” he says. “I knew that I either had to try and make Weekend Update work, or I would have to go somewhere else to perform.” His signature deadpan and smirk, along with his palpable chemistry with co-anchor Michael Che, have helped shape some of the segment’s most successful recent moments, from roasting then-candidate Donald Trump’s leaked Access Hollywood tape to interviewing memorable characters like Kate McKinnon’s Angela Merkel. Another screen comedy challenge that Jost regularly grapples with is specific to SNL, which, true to its name and trademark line, airs live. This means Jost and Che have to be strategic when joking about news items that are breaking or still raw, because there isn’t a chance for do-overs. There’s no shortage of hot topics, from the Harvey Weinstein sexual-abuse scandal to the Trump administration’s response to Hurricane Maria’s devastation of Puerto Rico. In cases like these, Jost says the trick is to pinpoint who’s at fault, either for hypocrisy or abuse of power. “Those are the subjects you’re trying to deal with,” he explains. “You don’t want to collaterally damage victims.” He also says it’s important to refrain from becoming pedantic or turning the segment into a moral lesson; this means considering whether a joke will land with the audience or only make it appear the show is taking a serious topic lightly. Such comic license can be a burden, Jost says, given how much material there is to choose from, “but it’s also really lucky,” because it’s an opportunity to elevate topics that really matter. It’s all about picking and choosing the right jokes for the right issues.